Bright futures for civil engineers. 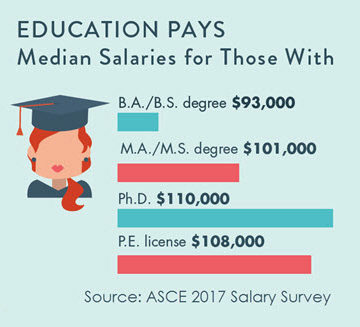 Results of the 2017 ASCE Salary Survey find that the median pre-tax income for civil engineers was $101,000 in 2016. Base salaries, meanwhile, have risen between 4 and 5 percent each year since 2014. “It’s an exciting time to be a civil engineer,” said Norma Jean Mattei, Ph.D., P.E., F.SEI, F.ASCE. “As professionals, we take pride in our work as the stewards of the nation’s infrastructure and value educational and technical advancement to continue as leaders. The survey results draw upon the data of 5,868 ASCE member participants. The typical respondent is a male in his early 40s, with a bachelor’s or advanced degree, and about 17 years of professional experience. 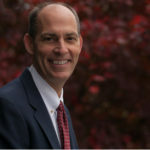 He is at the fifth or sixth of eight possible levels of professional responsibility, supervising a handful of other people, both professionals and support staff. 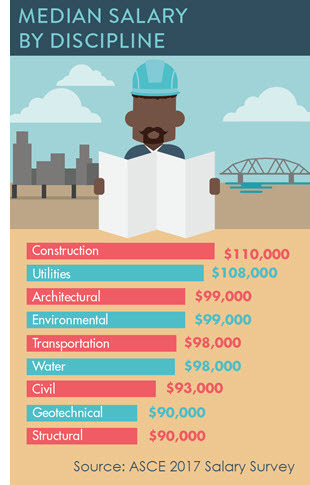 In addition to the strong salary figures, the survey reveals that most civil engineers receive comprehensive benefits packages. Typical benefits include basic health insurance and family coverage, 15 paid vacation days and eight holidays per year, paid parental leave, and more. The industry also values career advancement through paid professional dues, attendance at professional conferences, and educational assistance programs. These benefits help cover the cost of training and education needed to increase earning potential. • Those with a bachelor’s degree have a median salary of $93,000. • Those with master’s degrees have a median of $101,000. • Professional licensure increases the median salary to $108,000. • Those with doctoral degrees earn the most on average, with a $110,000 median salary. However, a pay gap persists for women and underrepresented minorities. The median salary for women is $83,000, compared with $101,400 for male respondents, about on par with the national average. Hispanic and African American respondents earned median incomes of $83,600 and $87,800, respectively. 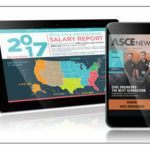 As part of the survey release, ASCE members get two free data runs on the new salary calculator – a powerful tool that breaks down an engineer’s expected income based on a variety of factors, including discipline, experience level, and location. Is there a place where the raw data of the report can be viewed? 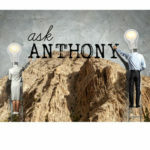 My interest is in the pay gap specifically, this issue comes up a lot and any extra data I could obtain would be useful! Some more detail on classification taking into account experience after a BS degree would help. Various sub-classifications can be considered. The following would be an example.